(WALTER S. MOSSBERG Wall Street Journal) After the upgrade, the Lenovo ThinkPad X301's touch pad couldn't scroll in the tabletlike Start Screen. If you're thinking of upgrading your PC to the new Windows 8, be prepared for hassles and disappointment, especially if the computer is more than a year or two old—even if it technically meets the basic requirements to run the new version. I know this, because I've spent big chunks of the past week trying to upgrade to Windows 8 two big-name, well-regarded PCs—a 2008 Lenovo laptop and a 2009 Hewlett-Packard touch-screen desktop. The process was painful, and it resulted in lost capabilities, even though both PCs ran Windows 7 quite well and met the minimum requirements for running Windows 8. To be sure, people upgrading newer PCs, whose makers anticipated Windows 8 or have software patches ready to accommodate it, will likely have a much better experience. I learned—too late—that neither of the computers I was upgrading was on the list of models for which their manufacturers provided such patches. This may be because, in both cases, aspects of their hardware weren't up to snuff for Windows 8's more demanding requirements. For instance, the touch pad on my Lenovo ThinkPad X301 laptop can't be used to scroll in the new tabletlike Start Screen environment in Windows 8, or to perform certain Windows 8 gestures. And, on the HP TouchSmart 300, the touch screen isn't precise or sensitive enough to reliably perform Windows 8's touch gestures every time. Plus, the microphone doesn't work. Oh, and to get the HP to stop freezing, I had to perform a procedure that wiped out most of my installed software, including HP and Microsoft programs. After watching friends and relatives struggle to share photos using Facebook, Apple's Photo Streams and Google+, Katherine Boehret organized some tips and tricks that might surprise even the most share-happy shutterbugs. Here is her guide in the Digital Solution. It isn't unusual for somewhat older PCs to be unable to take full advantage of a new version of an operating system. And Windows 8 is a big change. But I was surprised by how hard it was to discover that my two PCs weren't going to be able to fully work with the new system. I assumed Microsoft's installer would let me know, but it didn't. Part of this problem was my fault, I guess. If I had thought to burrow through the Lenovo or HP websites, I might have found that my models weren't considered by their own makers to be fit for upgrading. For instance, HP's information page, at http://bit.ly/SdTCVp, said this about my TouchSmart, after I located and entered its obscure, official product number: "HP has not tested this PC. For this reason, HP is unable to provide upgrade instructions or Windows 8 drivers. You may lose basic functionality & stability if you try to upgrade." Alas, I learned this only after I had upgraded. A spokeswoman for HP explained: "With any PC, it's critical that the hardware and software work well together and some older PCs in our portfolio, including the TouchSmart 300 which was introduced in 2009, are simply not able to take advantage of the extensive new features Windows 8 has to offer." Upgrading two machines to Windows 8 Pro was harder than expected. 1. Don't try upgrading any machine older than two years, preferably one year. 2. Dig around in the manufacturer's site before buying the upgrade to make sure the company supports your model for Windows 8 use. 3. Run the Upgrade Assistant first. 4. Even if your PC is supported for Windows 8, be prepared to spend time applying patches, and following complicated instructions. One HP document on the upgrade process runs to 29 pages when printed out. And a Lenovo spokesman said: "The X301 is five years old and Lenovo decided not to support it for Windows 8 upgrades. 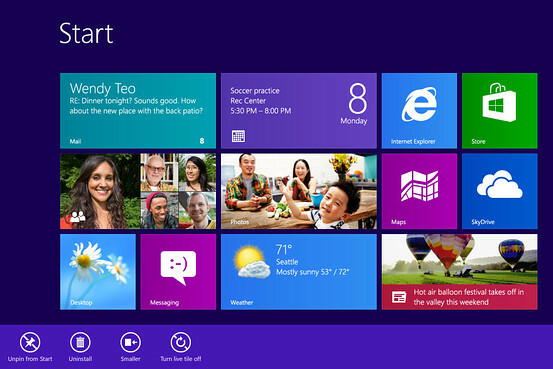 The touch pad hardware really can't support all the features of Windows 8." Microsoft does offer Upgrade Assistant software that might have warned me of the problems, available at http://bit.ly/SdUxFo. 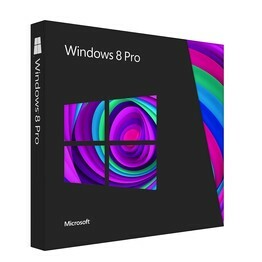 But the box for the Windows 8 Pro DVD I was using only suggested running this utility and checking with the manufacturer's website, in tiny type at the bottom of its back cover. My problem was that I had too much confidence in Microsoft's Windows 8 installer software. I had expected the installer, which also checks a PC to see if it can handle the new operating system, to tell me if there were key incompatibilities. It found exactly one: the Bluetooth utility in each machine. It told me to uninstall these before proceeding, and I dutifully did so. I asked Microsoft why the installer didn't warn me of the other incompatibilities I ran into, and an official said it simply doesn't know how every model might perform and that's why it recommends users look for the manufacturer's instructions and warnings. For a limited time, until the end of this month, you can buy an upgrade to Windows 8 for $40 via download or $70 via DVD. This gets you only the high-end Pro version, with added features that let users tap into certain corporate networks. Microsoft hasn't announced the eventual regular pricing, but I expect it to be at least $100 for standard Windows 8, and around $200 for Pro. The basic requirements for running Windows 8 are a processor running at 1 gigahertz or faster, and at least 1 or 2 gigabytes of memory, depending on whether your PC is a less demanding 32-bit or more demanding 64-bit system (the installer tells you). You'll also need at least 16 or 20 gigabytes of free storage, again depending on whether the PC is 32-bit or 64-bit, and a graphics system that can handle a Microsoft graphics standard called "DirectX 9 with WDDM driver." In my tests on both machines, the actual installation took about two hours, but a full workday or more was spent tweaking each machine, and getting updates to Windows 8 and its built-in apps. For instance, after the installation seemed done, I discovered I had lost the Wi-Fi Internet connection on both machines and had to temporarily turn off the firewall to restore it and then upgrade my antivirus software. The problems were worse on the HP, which I had thought would be easier because it's newer and has a touch screen. On the HP, Windows 8 proved so buggy at first that I couldn't even get back to the Start Screen—home base for the system—after opening apps and the computer froze up frequently. I was forced to perform a "Refresh," a process that reinstalls Windows 8 without erasing your data files, but wipes out all third-party traditional Windows programs except the new-style apps you've bought from Microsoft's online store. This Refresh got my HP running much better—except for the lost microphone and the inability of the older-style touch screen to work as well as new ones do. However, I lost dozens of programs, such as HP's touch software suite, the Google Chrome browser, iTunes, Windows Live Essentials, Firefox and more. So I had to spend more time reinstalling some of these. In the end, both machines ran Windows 8 pretty quickly, but clumsily. And both started up faster than before. But there was a penalty: Each machine wound up with 12 to 13 gigabytes less free storage than before. This is mainly because the installer gathers up incompatible files into a special folder called Windows.old. You can delete this folder to recover space, or Windows will delete much of it automatically after 28 days. 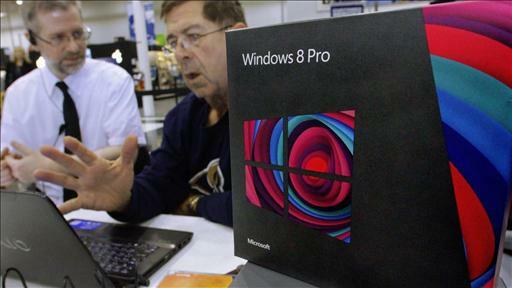 The industry really wants you to get Windows 8 via an all-new PC, and most people who adopt it will go that route. But, if you don't, or can't, and have even a three-year-old PC, you may want to just stick with the Windows you've got.